In 1969, at age 12, Mr. Holmes began training at the Tokyo Karate-Do Association located at 48th and Vine in Lincoln, Nebraska. Mr. Larry Durst, who has since retired, was the instructor. Eventually, Dr. Richard Schmidt, the head student at Tokyo Karate-Do Association, took over Mr. Durst’s teaching responsibilities. 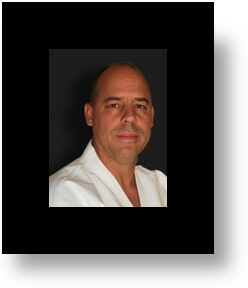 Dr. Schmidt is now the Director of Midwest Kenkojuku Shotokan Karate at the University of Nebraska Jinbukan Dojo. In November of 1980, Mr. Holmes earned his black belt in Shotokan Karate under Dr. Schmidt’s instruction at the University. He has since earned his black belt in the arts of Kendo (Japanese fencing), and Iaido (Sword drawing). For the past 30 years Mr. Holmes has been the director of the Children's Karate program at the Lincoln YMCA and continues as a senior instructor at the University's Jinbukan Dojo. In December of 2010, Mr. Holmes opened the doors to the Lincoln Budokan dojo, and welcomed his existing students to join him at the new location. In addition to his local affiliations, Mr. Holmes maintains his professional and teaching affiliations with the Okano Ha Kenkojuku International Association, the Rocky Mountain Kendo/Iaido Federation, and the All US Kendo Federation. "We will provide traditional martial arts training in a positive and safe environment while demonstrating good manners and respect for differences. Cultural awareness, community spirit, family values and physical fitness are our ways of life."